Our top rated Three Rivers restaurant is a favorite among visitors and local residents alike. Known for its continental cuisine, excellent service, and breathtaking views, The Gateway Restaurant offers a wide range of choices for lunch and dinner along with daily specials often featuring seasonable soup, fresh salads, and seafood. 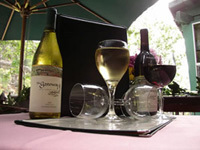 The Gateway’s large outdoor patio overlooking the Kaweah River offers the finest open air dining in the area. Enjoy the scenery while you savor your meal.